Since I grew up with an engineer, I am practiced in the dark art of taking things literally. This held me back in the early days of my writing; since fiction is life heavily edited, and the “editing” part seemed to me back then to be uncomfortably close to prevarication, I tended to write rather lifeless stories. I fancy that I have gotten better since then! These days I see the “editing” as a sort of fermentation process, a revelation and an augmentation. Wine is not grape juice; but the truth of the grape and its history with the land and the rain is revealed in wine (which often releases us to speak our own truths that we would otherwise conceal). Correct, down to the period. But, were we to obey it, we would have to go outside and around the building to the another, unsigned door to enter the room…. 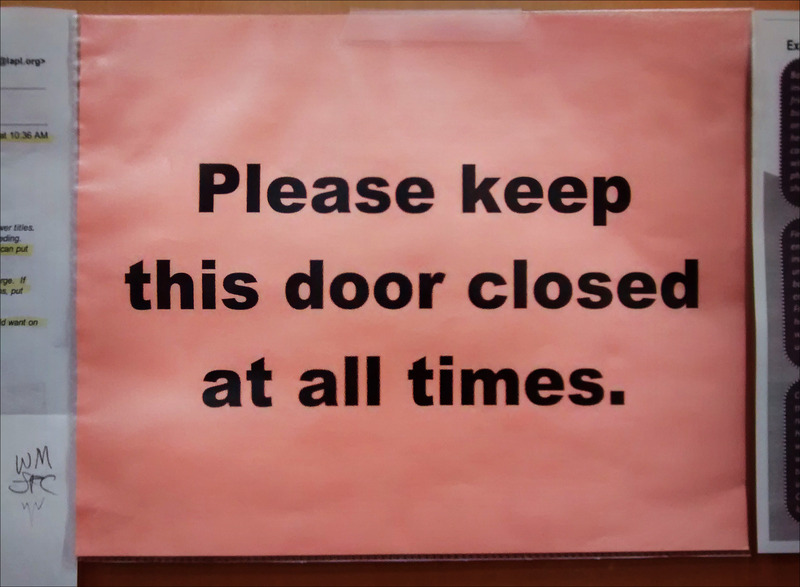 Of course, everybody knows what it really means: “Please close this door behind you after entering.” This shows that language is more than mere words, and certainly more than simple sequences of reference. Because we all understand the un-literal truth of that sign. This was something I had to learn the hard way, as I pondered why my early writing was competent, even poetic, yet often flat. I seem finally to have figured it out: a story, a piece of fiction, need not correspond to actual events; it need only create the sensations in the reader’s mind that experience of a possible event would engender had the reader been immersed in it. My reader need not see the tree that I saw when I write of a tree; my words must guide said reader to build, in his or her mind, a construct of a tree whose meaning resonates with what I felt when I saw “my” tree. The sign’s admonition is, in any case, routinely disregarded. The door is left open most of the time. The instruction taped to it is too literal too have any meaning. Even its figurative one. Really thought-provoking and insightful. I love this post!